Demonstrators gathered by the thousands and marched towards the West End to push for a greater commitment to clean energy on the eve of the UN Climate Change Conference. 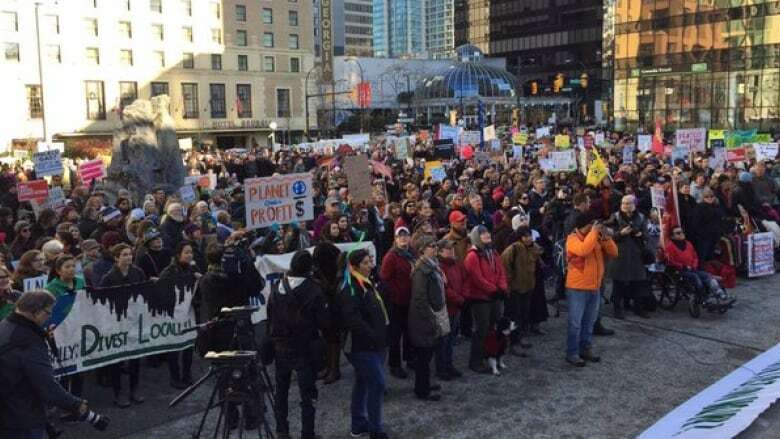 British Columbians turned out in the thousands to walk in Vancouver's Global Climate March. The grassroots movement was led by various environmental groups and First Nations. Crowds started gathering around 1 p.m. PT on the steps of Vancouver's Art Gallery and marched throughout the downtown core. The demonstration was part of a global campaign pushing world leaders to commit to clean energy during their meeting at the United Nations Climate Change Conference in Paris starting on November 30. Known for his stance against the proposed Kinder Morgan pipeline in Burnaby, Grand Chief Stewart Phillips, the president of the Union of B.C. Indian Chiefs, showed his support at the rally. Many held handmade signs citing the significance of climate change. Traffic in downtown Vancouver came to a halt as the marchers headed west. A gas station along the path of the demonstration was also taken over. Vancouver Police said there were major delays in downtown due to the march.